Composed by Sylvius Leopold Weiss (1686-1750). Arranged by Richard Sayage. Savage Classical Guitar Virtuoso Editions. 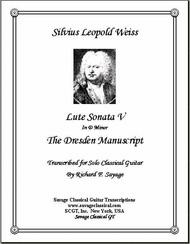 Complete Lute Sonatas from the master lutenist transcribed and arranged for solo classical guitar. Baroque. Book. With standard notation. 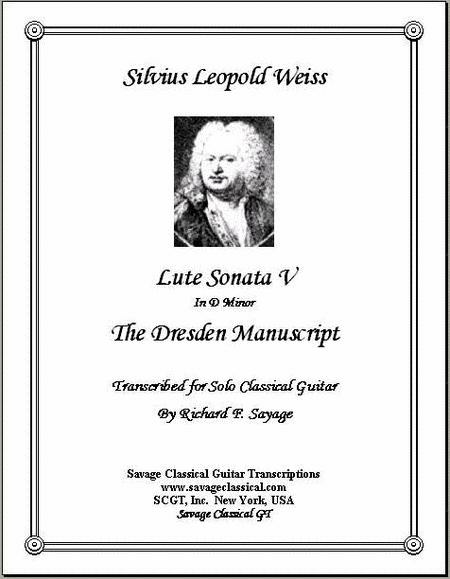 Published by Savage Classical Guitar Transcriptions (SJ.SCGT-0405). Sonata 5 from the Dresden Manuscript arranged for solo classical guitar.